About 70 people show up at an Oklahoma City church to learn about the Affordable Care Act. In just six weeks, nearly one in 10 Oklahomans will be able to buy subsidized health policies from private insurance companies through a new online marketplace set up by the federal government. Many more who don’t qualify for the subsidies will still be able to shop on the marketplace and obtain coverage, even if they’ve been turned down in the past for pre-existing conditions. But it won’t be simple. Several companies will offer policies, with different levels of coverage. Tax credits will be available for people falling within certain income ranges. Many people will need one-on-one assistance to navigate the registration process. Don’t expect state government to lend much of a hand. Because of widespread opposition to the Obama administration’s Affordable Care Act, state officials will play no direct role in helping Oklahomans determine whether they might benefit from the new health insurance marketplace, or exchange. So far, no state websites provide any information or assistance. No state agencies have assigned anyone to help with outreach efforts. The state’s role will be limited to telling people who ask where they can go for information. In most cases, that will be the federal government’s marketplace website, www.healthcare.gov. The marketplace is one component of the Affordable Care Act, widely known as Obamacare. Beginning Oct. 1, Oklahomans who can’t get coverage from their employers and who don’t qualify for public programs like Medicaid and Medicare will be able to shop for insurance on the new health marketplace. The Oklahoma marketplace is being operated by the federal government because Fallin rejected the option of setting up a state-run marketplace. Fallin also rejected a federal proposal to expand Medicaid in Oklahoma. As a result, many of the poorest working-age adults will receive no government assistance under either program. The insurance marketplace will offer a variety of plans. It will allow users to compare prices and apply for coverage. The policies will be provided by private insurance companies and will take effect beginning Jan. 1. Depending on their income levels, participants will be eligible for tax credits or refunds to help offset the cost of the premiums. Some will also qualify for health care cost-sharing payments. According to the U.S. Census Bureau, nearly 700,000 Oklahomans, or 19 percent of the state’s total population, were uninsured in 2011. An analysis by the group Families USA estimates that 337,000 of them will qualify for Affordable Care Act tax credits and can buy insurance on the marketplace. But that figure significantly understates the total number of marketplace participants. The marketplace will provide access to insurance for people who make too much money to qualify for tax credits but have been turned down for private insurance because of pre-existing conditions such as diabetes or high blood pressure. Its policies also could attract people who currently have private market insurance, but are considered “underinsured” because of high deductibles or coverage limitations. Former Senate Democratic Leader Andrew Rice said he thinks state leaders may be underestimating the potential appeal of the marketplace to a broad swath of the state’s population. “This is going to get people out of the uninsured world into being covered. It saves lots of money for the health care system over time. So it would be in their interest to do it,” said Rice, who oversees a network of 15 Variety Care community health centers. Weintz said the governor had asked Oklahoma Secretary of Health and Human Services Secretary Terry Cline to develop a plan to define the state’s role in providing referrals to citizens seeking information about the marketplace. Cline, who also serves as commissioner of the Oklahoma State Department of Health, said in an interview he was still considering possibilities for dispensing information. The Health Department’s home page does not mention the Affordable Care Act. Its “How Do I…?” page, which provides advice on everything from getting a birth certificate to dealing with mold, has nothing about the marketplace. The Oklahoma Health Care Authority oversees two big government health programs, Insure Oklahoma and the state’s version of Medicaid, called SoonerCare. Spokeswoman Jo Kilgore said the authority intended to provide a link and phone number to the federal program. The Oklahoma Insurance Department also provides no basic information about the Affordable Care Act on its website. Instead, it has posted a statement applauding efforts by the state to thwart the federal law. Deputy Insurance Commissioner Mike Rhoads said the department planned to provide referrals once the marketplace is up and running. Rhoads said four insurance companies have applied to the federal government to offer policies to Oklahomans through the marketplace: Coventry Health Care Inc., BlueCross Blue Shield of Oklahoma, GlobalHealth Inc. and CommunityCare. Officials said the list of companies, policy provisions and premium amounts would be released in mid-September. Oklahoma Policy Institute Director David Blatt, whose nonprofit group favors expanded government safety-net programs, said he was aware of no branch of state government that was providing information or referrals about the health insurance marketplace. “As far as we can tell, the answer is a resounding, heartfelt, ‘Hell, no,’” Blatt said. The federal government has assumed primary responsibility for disseminating information in 27 states that declined to operate their own marketplaces; it is assisting with the exchanges in seven other states. In July, it handed out $1.7 million in grants to 73 Oklahoma health clinics so they could hire people to provide one-on-one counseling to potential applicants. On Thursday, the U.S. Department of Health and Human Services announced another round of grants totaling $1.6 million to three Oklahoma networks that have agreed to serve as marketplace “navigators.” They will engage in community outreach activities as well as individual counseling. The recipients were Oklahoma Community Health Centers Inc., Little Dixie Community Action Agency and the Cardon Health Care Network LLC. The largest grant went to Community Health Centers, which agreed to place navigators in 57 cities around the state with a goal of reaching 80,000 uninsured people. In the meantime, the job of spreading the word in Oklahoma has been taken up by a loosely knit coalition of churches, community groups and other interested individuals. Together, they have formed what might be called the ACA Underground. 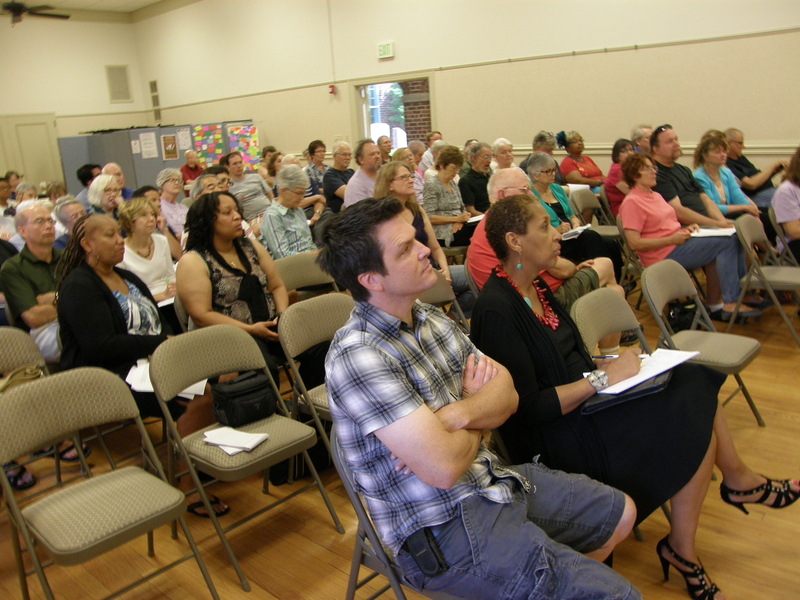 On Saturday, Aug. 10, about 70 people showed up a health marketplace information session held at the First Unitarian Church in Oklahoma City. The meeting was organized by Voice OKC, an organization consisting of about 30 churches, schools and nonprofit groups. Johnstone and other marketplace advocates fielded questions from people who weren’t sure how the how the health insurance marketplace would work and whether it was right for them. Hugh Meade, an independent sign contractor, said he and his wife had gone without insurance for years. He said he shopped around for private insurance only to find that health coverage would be more expensive than his house payment.